Here's an uncharacteristically early in the day post from me! My boyfriend is at work, my son is asleep, so I thought I might as well do something productive instead of just watching TV! Then I might treat myself to some chips and a bit of shopping later on! Today I have A England Ascalon to show you. I bought this online when I was at my Dad's because they had a 30% off deal in honour of Tristam's (Adina's cat's) birthday. I bought Princess Sabra (Tristam Eyes), which you can see here and Ascalon. 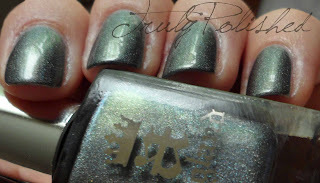 Ascalon is a grey polish with a scattered holographic effect and a duochrome which goes from lavender to a VERY subtle green, which looks grey most of the time. The application of this was really good, it was almost a one coater but I ended up using two coats. I used Cult Nails Wicked Fast as a topcoat which made the drying time really fast. These swatches were taken this morning (Monday) and I actually put this on, on Saturday morning. It is still immaculate after so many days, but I think I'm going to have to change it later on because I get bored so easily! Here are some photos, as I mentioned before, this is two coats with topcoat. My camera didn't like this polish at all. The purple in the polish is so obvious in real life but it was almost impossible to get it to show up on the camera! I managed to get it to show on one of the flash pictures as you can see, but it's even more obvious in real life! You can buy this from Llarowe but I bought it direct from A England here. It retails for £9 and they offer free internation delivery, which is always a bonus! I love A England and their Jubilicious Collection has a couple of polishes I want so I'm VERY TEMPTED!